This report Broadening the Appeal of Environmental Action through Values Framing Uplift presents evidence from UK surveys which shows how environmental and conservation groups could reach beyond the ‘green ghetto’ to attract a wider, more ‘mainstream’ audience. Many NGO environmental campaigns and government-sponsored attempts to encourage pro-environmental behaviours struggle to reach beyond ‘the converted’. Surveys show that in most cases the engaged support base of environmental NGOs is dominated by the psychological group Pioneers (inner directed). Most of their staff are also Pioneers. Their campaigns are usually framed in ways that appeal more to Pioneers, than to Prospectors (outer directed) or to Settlers (security driven). Surveys also show that many Prospectors and Settlers are potentially just as ‘green’ but are not being engaged. This report gives examples from surveys conducted for the Fairyland Trust and Greenpeace UK, demonstrating that by using differently framed propositions, such as about ‘nature-for-children’ rather than just action for ‘nature’ or ‘environment’, support amongst Settlers and Prospectors can be significantly increased. On climate change, the gap between the position of ‘the public’ measured in a National UK survey, and that of Greenpeace UK Supporters as reflected in a Supporter survey asking mostly the same questions, can be reduced by as much as 38% if you test the statement “There’s still time to address climate change if we all make quite small and easy changes” as opposed to testing belief in climate change. 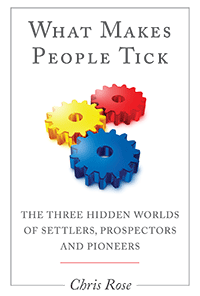 The reduced gap (7.5% as opposed to 45.1%) is mainly due to increased support from Prospectors and Settlers. 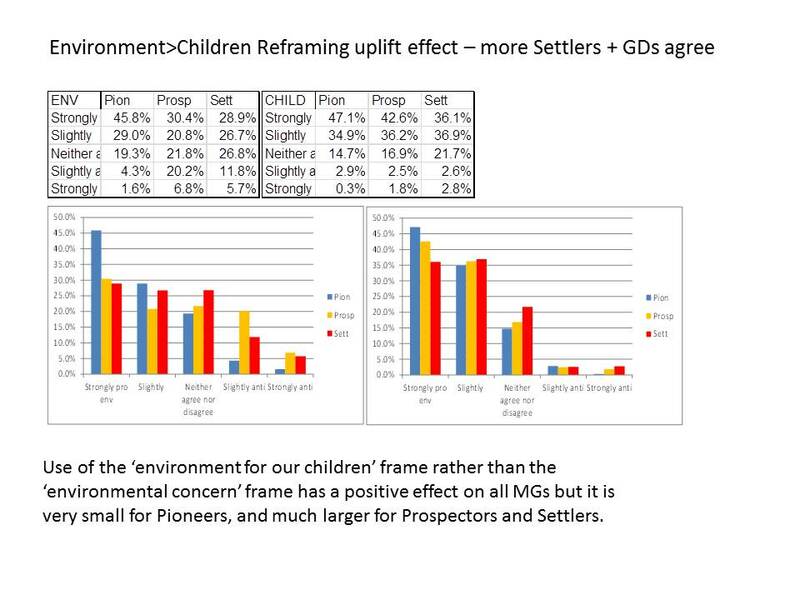 Similarly, the ‘gap’ between where Greenpeace Supporters are and the National population is, on ‘environment’ is closed from 49% to 21% by use of a for-children framing, again almost all by uplift amongst Settlers and Prospectors. As the underlying reasons for differences are psychologically fundamental (such as different senses of self-agency and the importance of being a parent in self-identity), these findings are also likely to apply to other ‘causes’, where these are primarily framed in ethical and Pioneer terms.